On this page we showcase Dr Makoni’s published books. Please check beneath the description for a free pdf downloadable version of the book. If any of the books have blessed you please feel free to distribute to friends. 1. 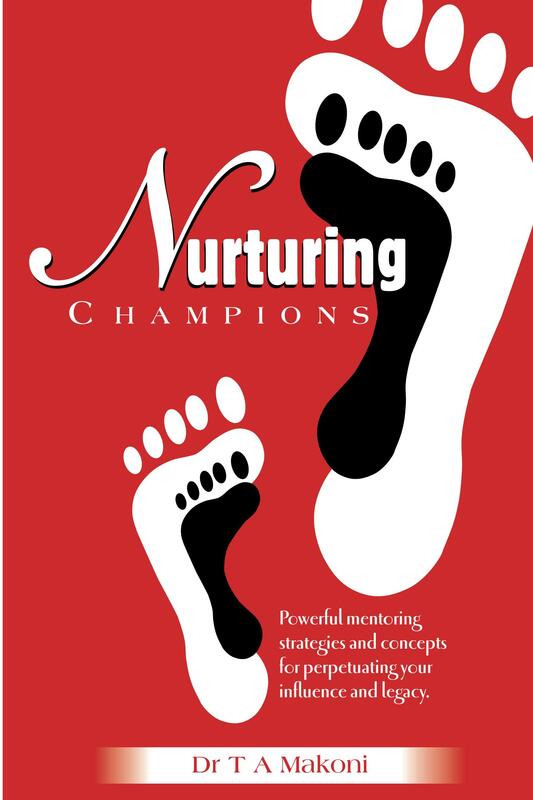 Nurturing Champions: Powerful Principles for Perpetuating Your Legacy. 2006 Rapha Trust. This book is a powerful manual for mentorship. It gives practical guidance based on proven principles to both mentors and mentees. It tackles topics like: The case for mentorship, models of mentorship, psychology of mentorship, benefits of mentorship, dysfunctional mentorship, mentorship roles etc. This is a balanced and powerful book for enhancing your leadership skills. 2. Entrepreneurship on Trial: Entrepreneurial Principles and Concepts from Zimbabwean Banking Entrepreneurs. Rapha Trust 2011. This powerful book traces the entrepreneurial journey of Zimbabwean bankers from 1995 up to 2005. It draws principles for entrepreneurs from four live case studies and some practical examples of the challenges that entrepreneurs in the Zimbabwean financial services had to endure. It deals with issues like the causes of the Zimbabwean banking crisis, a brief historical background of Zimbabwean banking, four cases studies, entrepreneurial benefits to all stakeholders, managing growth, managing change, financial strategies of funding your start up etc. The book targets MBA students, entrepreneurs, leaders and anyone interested in knowing how to start a business in a volatile environment. This book presents a coherent theology of giving, defends the biblical place for tithes. The other forms of giving discussed in detail from a biblical perspective are freewill giving, firstfruits, sacrificial giving and alms giving. It is both practical and theological in nature. This book is a just for every believer and more so should be in every pastor’s library. It is based on a study of both the scriptures and church life in Africa. I believe that this book is a manual for everyone serious about the end time harvest of souls and its resourcing. This book is a contribution to the call to increased prayer engagement. I believe God that the words of this book will reignite and/or inspire some battle weary saint to renewed vigour in pursuing God. I deliberately write from my primary gifting of a teaching pastor with the aim of calling the saints to engage in prayer with understanding. I am concerned at the Body of Christ when people focus on mindless prayer. The central theme of this book is that prayer is serious business. In this business there is a full arsenal of weapons that can be used to pray effectively. I attempt in this volume to expose different kinds of prayer. Some of the prayers covered include governmental prayers using decrees and declarations, clarifying speaking in tongues, the prayer of faith, binding and loosing, prayer of consecration etc. It makes a distinction between two forms of praying in tongues and two forms of speaking in tongues. Not all speaking in tongues is prayer. The book also highlights the need of patience being mixed in faith when people pray. 5. The Tabernacle of David: The Key to Discipling Communities and Nations. This book speaks to the Church’s Mandate of discipling nations. The Tabernacle of David is a key revelation to national impact by the Church. It restores the place of believers as kings and priests who should not choose one function above another. They should exercise both functions for Kingdom expansion. It explores other worldviews and how they are discipling cultures. It provides case studies from competing worldviews on how to disciple our world. Jesus said, “Go disciple nations!” So far the Church has been doing a poor job of this. I believe that this revelation is one more cog in the wheel that will help believers take their place of influence and advance the Kingdom mandate on earth. May His Kingdom come and His will be done on earth as it is Heaven! Dr Makoni builds on the power of grace to shape the doctrines of dominion. The book is aimed at people who desire to change nations and cultures for Kingdom purposes. i am inspired by your articles. they are very insightful. keep the good work!